In 1948 the British Government began planning counter measure's against a possible Nuclear Attack on the UK, intially conventional Nuclear Weapons like the Atom Bomb had to be dropped from a plane, just as conventional bombs were dropped in WWII, in some way's this was a blessing, approaching enemy aircraft could be spotted by radar and intercepted and shot down by RAF fighters. However, as with any technology it is adapted, modified, upgraded and improved over time. Since the A-Bombs of 1944 that were dropped on Japan, Nuclear Weapons had progressed at an astounding rate, the A-Bomb's replacement came in 1952 under the name of the Hydrogen Bomb or H-bomb as it was shortened too. The H-Bomb was a more refined version of the A-Bomb with twice the lethality. It was also smaller in size, meaning it could be deployed by smaller aircraft or even missiles, rendering conventional methods of interception redundant. By now it was quite clear that if a third World War occured, no one would be safe. The British Government which had resided in London during WWI and WWII was now at serious risk of anhialation. If a Nuclear Bomb was dropped on the capital, the Government would be taken out in a single blow. This would not only mean the total destruction of Government but would also cause the destabalization of the nation, law and order, transportation, infra-structure, food, water and power supplies and the organizational structure of the UK, and even its Armed Forces would cease to exhist. The reality was, the UK would be effectively back in the stone age. The answer came in 1949 with the "War Rooms" the War Rooms were conceived in 1948, as a counter measure to a Nuclear Strike on the UK and to maintain Government in the event of Nuclear War. The plan consisted of dividing the UK, Scotland, Wales and Northern Ireland into eleven sectors, or as they were officially referred to, Defence Regions. The War Rooms were two storey concrete bunkers with walls that measured upto 7 feet thick. Dispersing the Government to these 11 War Rooms around the UK, would ensure the continuation of Central Government if Nuclear War broke out. Construction of the War Rooms started in the spring of 1953, the last one to be completed was Shirley in Birmingham in 1956. In 1958 Central Government realised that the advancements in Nuclear Weapons had progressed to such a stage, that any site in the UK could be targeted, Downing Street, Parliment and Military Installations were now under direct threat. The War Rooms that had only been completed two years earlier, were now deemed redundant due to the minimal level of protection they could offer. Another key point which had been overlooked until now was fall-out, fall-out is radioactive material that follows a Nuclear Blast, those nearest to fall-out will suffer radiation poisioning and ultimatley die, as will livestock and vegatation. Buildings also suffer from rapid degradation. The further away from the blast, the fall-out becomes less lethal, but can cause long term illness such as cancer and deformed growth. With this new information the British Government approved two feasability studies to be carried out on a potential Nuclear Strike on the UK. These studies became known as ACE HIGH and CLOUD DRAGON, both studies concluded that, if the UK was targeted under present conditions, it would not survive neither would the Central Government. Not long after these studies The Bishop Committee was established, the Bishop Committee recommended that in order for Central Government to survive a Nuclear Strike, it had to be dispersed around the country. On this advice rogramme was approved by Parliment, Programme called for the construction of 16 purpose built Nuclear Bunkers which were to be designated: Regional Seats of Government (R.S.G. ), England was to have 10 RSG's, Scotland would have 4 RSG's, Wales would have 1 RSG and Northern Ireland 1 RSG. 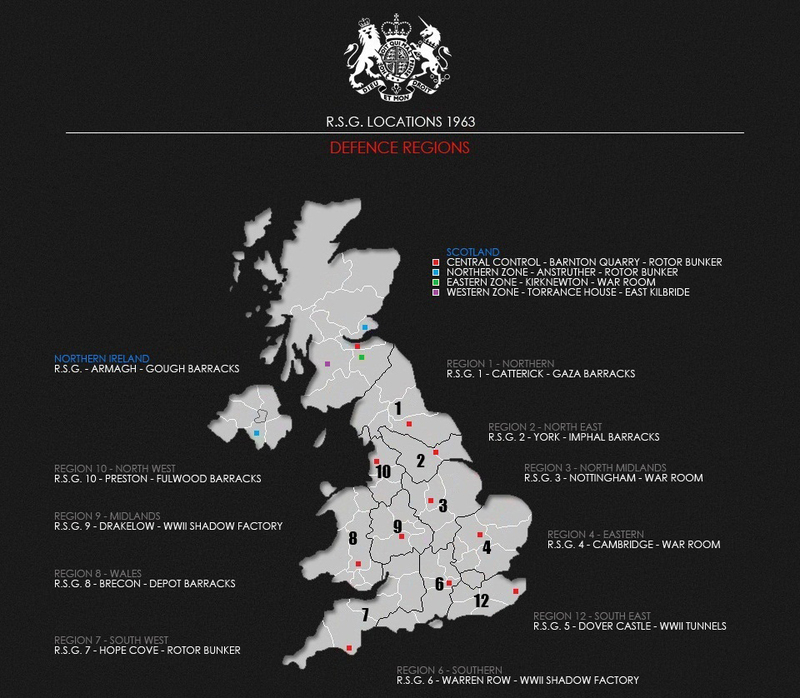 The RSG's were to be split across the country into Defence Regions 1-10 (Later changed to 1-12). Construction of "Programme X" started in late 1958 and was completed in May 1961, some 5 years ahead of its projected completion date of 1966. 1. Accomodate 300-350 members of Staff. 2. Resist a near miss by a Nuclear Weapon. 3. Linked into communications systems such as the BBC's Emergency Broadcasting Network, know as the Wartime Broadcasting Service (WTBS). 4. Capable of operating independently for several months and be totally self sufficient. The first six RSG's to be built were: Hexham (Northern), Shipton (North East), Reading (Southern), Taunton (South West), Llandridnod Wells (Wales) and Lancaster (North West) at a cost of £2 million each (£25 million in todays monetary value). Nottingham, Cambridge, Drakelow and Dover Castle were refurbished to bring them upto RSG standards. Catterick (Northern), York (North East), Preston (North West), Brecon (Wales) and Bolt Head (South West) were to be used as emergency regional headquarters until the purpose built RSG's were completed. All RSG's were fitted with 3 Telegraph and 5 Telephone circuits for communcations. In 1961 the first RSG's became operational, but in the haste to build them one small factor had been overlooked, the operational procedures for them to operate. 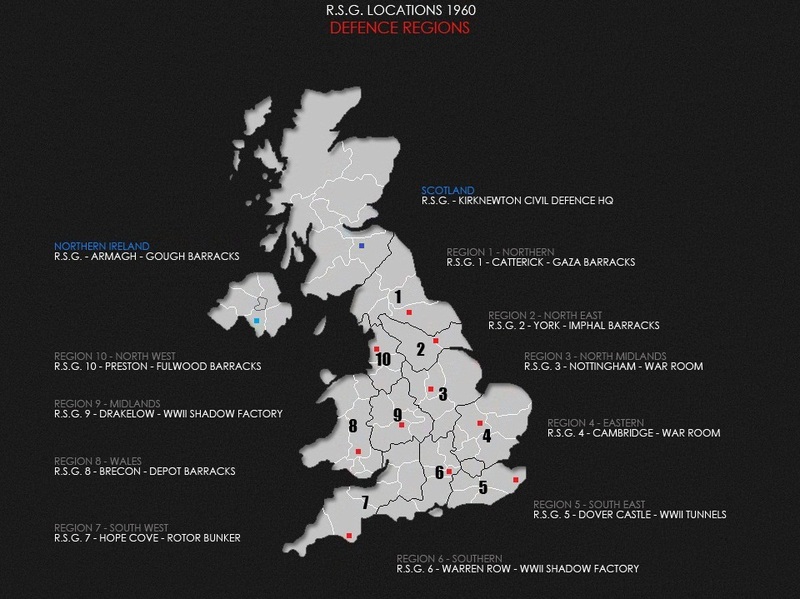 This small oversight became apparent when RSG's: 6 (Warren Row - Reading) ,7 (Bolt Head - Devon), 8 (Brecon - Wales), 9 (Drakelow - Kidderminster) & 10 (Fulwood Barracks - Preston) took part in Excercise's: De Novo (North East), Mercian Trump II (Midlands), and Jackpot. The function of the RSG's were to maintain the continuation of Central Government, they would run their Region as if it were Central Government running the country. All decision making, allocation of resources and distribution of food and power, retaining law and order, command of emergency services and the Military and the reorganizing and rebuilding of the infrastructure, would be controlled by the RSG and the Regional Commissioner and his staff. Unlike its predecessors, the War Rooms and Joint Civil-Military Headquarters, the RSG's would have no role in the pre-attack period to Nuclear War. However, after a Nuclear Strike the RSG would assume full control over its Defence Region for an idefinite period, this complete control would remain until Central Government could be re-established at national level. In September 1962, six of the RSG's were activated again to take part in FALLEX-62, a NATO excercise simulating a Nuclear Attack. The RSG would be under the control of the Regional Commissioner who literally had the power over life and death. If law and order began to fail, the Regional Commissioner could invoke the Death Penalty on orders from the Summary Courts of Justice, this could be implemented in the event of public unrest, rioting and looting. This order would of been carried out by the Regional Military Commander, as the Military were responsible for keeping law and order in the majority of the Region. A typical RSG was meant to accomodate between 300-350 members of staff, but this number could extend to around 430. The RSG would be headed by the Regional Commissioner, Deputy Regional Commissioner, Principal Officer and Secretariat. Underneath these would be all the Government departments which applied in peacetime as well as Scientific Advisers and Uniformed Services, which consited of: Police, Fire, Civil Defence and the Military. The RSG's unlike the War Rooms were not stocked with supplies or rations during peactime. They would only be stocked in the run up to Nuclear War and then only be stocked with enough rations for a 30 day period. After this date it was expected that fall-out would be low enough for staff to leave the RSG. The staff needed to operate the RSG were chosen by the Regional Directors of Civil Defence, and were a mixture of: volunteers, professionals from Civil Defence, the Police, Fire Brigade, Doctor's, Scientist's, Junior Civil Servents and the Armed Forces. The Scientific Departments which could not be as easily be staffed by volunteers, was complimented by the addition of 12 volunteers from the Royal Observer Corp from 1967, to assist in fall-out predictions. All vital communications for the RSG's would of been initially installed prior to an attack by the Territorial Army's No. 2 Signal Group (National Communications). The Emergency Communications Network (ECN), which was used for land line calls and Telex systems was already in place and had been concealed within the normal civillian telephone network. Operating the communications was originally handled by the Territorial Army, but this was later changed in the late 1960's to include volunteers from local Civil Service, who would be trained to use the equipment during peacetime, in anticipation for Nuclear War. Regional Commissioner, Deputy Regional Commissionier, Principal Officer & Secretariat. Ministry of: Health, Power, Labour, Works, Housing, Transport, Aviation, National Insurance & Pensions, Supply and Agriculture Fisheries & Food (MAFF). Uniformed Services - Police and Fire Service. Military Liaison - RAF, Army, Royal Navy and Territorial Army. All decisions were made by the Regional Commissioner Committee consisting of the Regional Commissioner, Deputy Regional Commissioner, Principal Officer and Departmental Heads who would meet daily. Decisions would be put into effect by the Secretariat acting like the Cabinet Office and Cabinet Secretariat. The Secretariat and its own information unit were responsible for situation reports and long term strategy for the Region, they would also distribute this information to other RSG's in neighboring Regions. The Regional Commissioner would also relay information to the surviving public via the purpose built BBC Studio located within the RSG, these broadcasts were intended to give the surviving public hope, and that the Government was starting to rebuild the country. CLICK - All Government Departments to start Transition To War procedures. MANUSCRIPT - Whitehall Teleprinter Network to be be activated 24-hours a day. FENCER - Selected Government Departments and BBC to implement 24-hour operations. JIGGER - War Book Measures to be implemented. TARPON - Full War Readiness. If the Codewords were issued, all staff of the RSG with the exception of the Military, were sent a letter from their relevant personnel department informing them that they had been selected for duty at an important wartime HQ. So far as anyone can say at the moment you may be there for about a month. They were instructed to leave immediately and pack their personal effects, then proceed in their own transport to their designated RSG. In 1960 the Government approved construction of R.S.G. 9 at Rover's former No. 1D Shadow Factory at Drakelow. The RSG was to occupy half of the entire site and was to be operated by 275 male and 75 female staff. 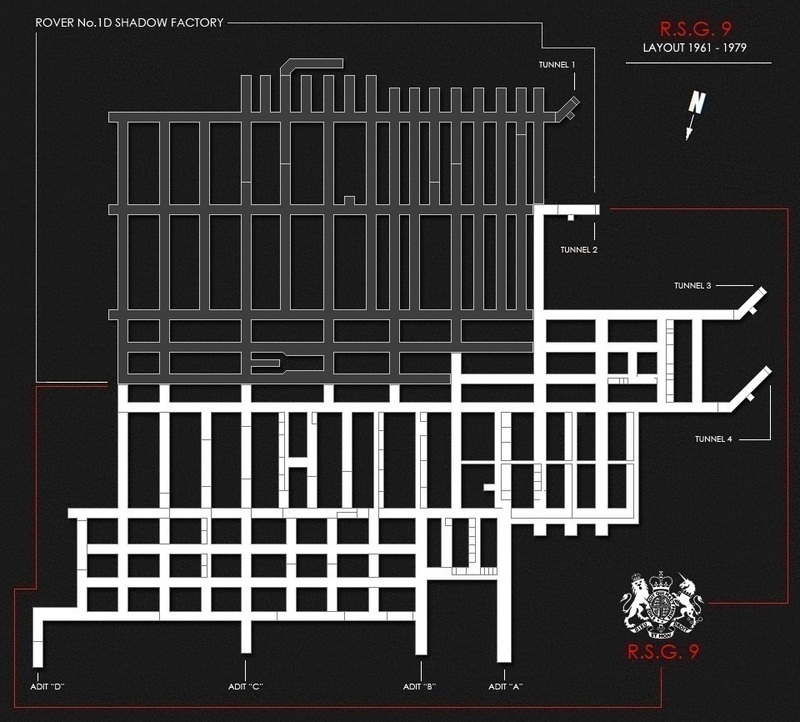 Building work commenced in 1960 in the old RAF Stores and the Rover Offices section. The old Rover Canteen and Kitchen were upgraded with new industrial cooking equipment capable of catering for the 350 staff. The Clocking in Offices located in the entrances of Tunnels 1-4 were refitted as Security Offices for all staff entering via the tunnels. New communications equipment was also installed, although this was very limited, some of the equipment installed were: Creed Type 7B Teleprinters which connected to Whitehall and the Central Government War Headquarters in Wiltshire (CGWHQ Subertfuge). Additional communications equipment such as radios would be installed just before a Nuclear Strike by members of the Territorial Army's No.2 Signal Group (National Communications). A transmitter Mast was installed above the complex which for radio communications between the Government, surviving RSG's and the Military. Broadcasts from the purpose built BBC Studio could also transmit pre-recorded messages via the BBC's War Time Broadcasting Service (WTBS) through the mast as well. However, due to cost's Drakelow was never reinforced or equipped with adequote protection against a Nuclear Blast, the only thing seperating the RSG from the rest of the Shadow Factory was a series of purpose built brick walls. The entrances to Tunnels 1-4 were not altered, and the wooden air lock doors from WWII were left as they were. The only other conversion to take place was the installation of a water tank, and upgrading the ventilation system. The reason behind such minimal contruction was: Drakelow was far enough away from a major city and thought would not be directly targeted. Construction was completed in May 1961. The cost of converting Drakelow to RSG status still remains classifed, but it is thought to have been around £500,000. R.S.G. 9 - Drakelow was activated in 1961 and covered Defence Region 9, which consisted of Shropshire, Staffordshire, West Midlands, Warwickshire, Hereford and Worcester. Shorlty after being activated, R.S.G. 9 Drakelow took part in Excercises: Mercian Trump II and Jackpot along with: RSG - 6 Warren Row , RSG 7 - Bolt Head, RSG 8 - Brecon and RSG 10 - Fulwood Barracks. The purpose of the excercise was to see how effective the RSG's would be in a simulated Nuclear Attack, the results however, were far from what was expected, as at the time no formal operating procedures had been issued to the RSG's informing them of how they were to operate. After the excercises were over, staff returned to their normal peace time roles and the RSG's were placed on what is termed as "Care & Maintenance". A skeleton staff would remain to ensure the facilities were kept maintained and ready for immediate use if necessary. Unlike all the other RSG's, Drakelow still possesed a vast amount of surface buildings from its Shadow Factory role in WWII, with many of them still being used until the 1970's. Sadly during the 1980's and late 1990's the remaining surface buildings were all demolished. Today only the Sub-Stations remain. In 1955 the British Government had issued a TOP SECRET report stating that R.S.G. 9 - Drakelow was to be given the Codename: MacAdam. 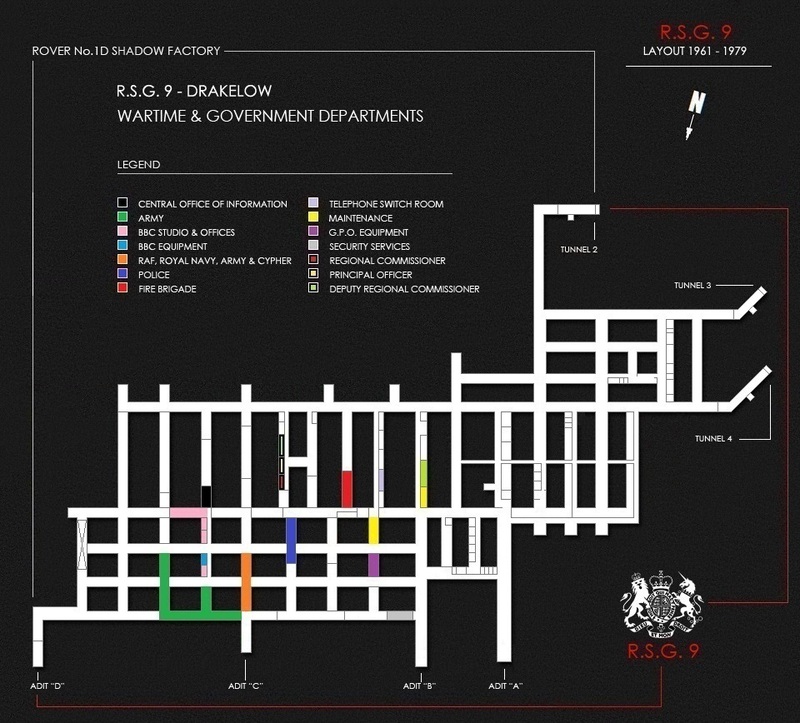 In late 1952 the Government had approved the construction of a TOP SECRET facility to be constructed in parallel with the building of the RSG network, this facility was to be the Central Government War Headquarters (CGWHQ), Codenamed: Subterfuge (Later known as: Stockwell, Burlington, Turnstile, Chanticleer, Peripheral, Eyeglass and Site 3). CGWHQ Subterfuge was constructed in Spring Quarry Wiltshire, an old WWII ammo dump which covered 35 acres and had a network of 10 miles of internal tunnels and capable of housing 4,000 staff. In the event of Nuclear War, the RSG's would command their own Defence Regions but ultimatley report to CGWHQ Subterfuge, which would be where Central Government would be located. The Government knew this was a risky move having so many important people in one location, and if targeted for a Nuclear Strike this move would cripple the country. With this in mind contingency plans were drawn up, if Nuclear War occured Central Government was to be operated from 3 locations: The "First Eleven" located in central London, CGWHQ Subterfuge in Wiltshire and "MacAdam" in Kiddermister. Originally the site chosen for "MacAdam" was the "Valley Works" an old WWII chemical weapons facility in Rhydywmwyn, Wales. At the time the Treasury was also looking at the "Valley Works" as a possible location to store the UK gold reserve in case of Nuclear War. NATO had also expressed an interest in the site as well, for the NATO Oil Executive Board (NOEB) and Defence Shipping Executive Board (DSEB), originally earmarked to be located at "Subterfuge", but this was rejected on the grounds of National Security. The only feasible location left for MacAdam was R.S.G. 9 - Drakelow. Drakelow was also the only site capable of housing thousands of staff needed to operate Central Government. The total staff expected to occupy "MacAdam" was between 1,500-2000 staff, in reality this would of been reduced to 1000. To date, no costs, surveys, blueprints or declassified documents have emerged on "MacAdam" which would indicate this was no more than a feasability report. In 1960, the Codename: Macadam was dropped from R.S.G. 9 - Drakelow and replaced by the Codename: Quadrangle, this codename remained until 1962. To date very little information is known about Drakelow's period when it was codenamed "Quadrangle". The only information that is known for certain, is that no work was carried out to upgrade the complex during 1960-1962. 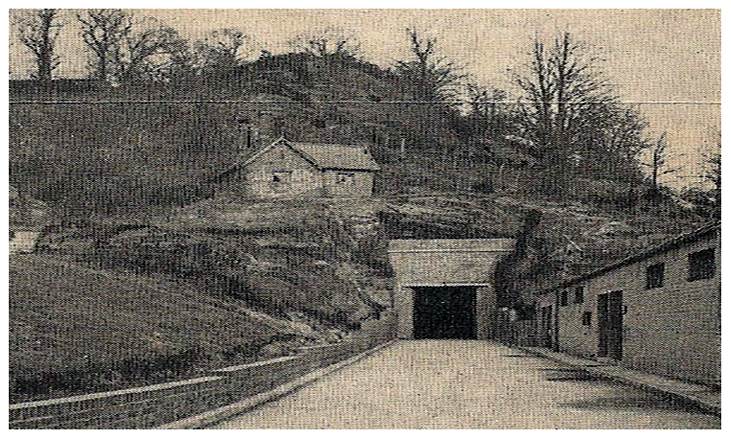 Rare 1962 photo of the entrance to Tunnel 1, before the Vent Shaft's were installed. Photo courtesy of Mr. Richard Cruise. In 1962 Codename: Quadrangle was dropped from Drakelow and replaced by Codename: Linstock. From recently discovered declassifed documents, it seems Drakelow was once again proposed as the secondary location for CGWHQ Subterfuge. 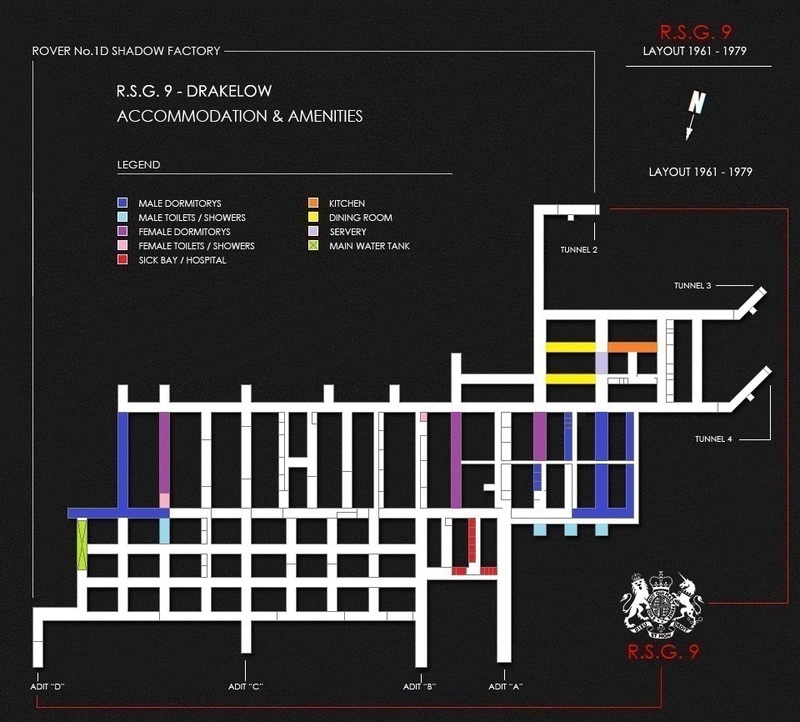 Blueprints show that "Linstock" was to be built in the old Rover Shadow Factory section not occupied by R.S.G. 9. 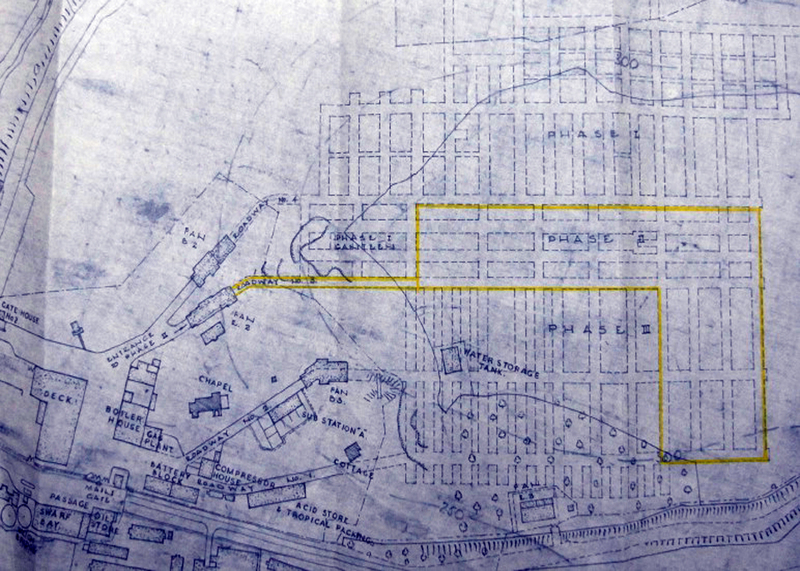 The RSG would be designated Phase I, "Linstock" Phase II and Phase III, access to the site would be via Tunnel 3. Phase III at this time was to be considered as a medical stockpile under the direction of the Controller of Supplies. To construct "Linstock" it was estimatedt that, 45,000 sq. ft. would be needed according to a report in 1961, the total cost of the development was expected to cost £25,000. 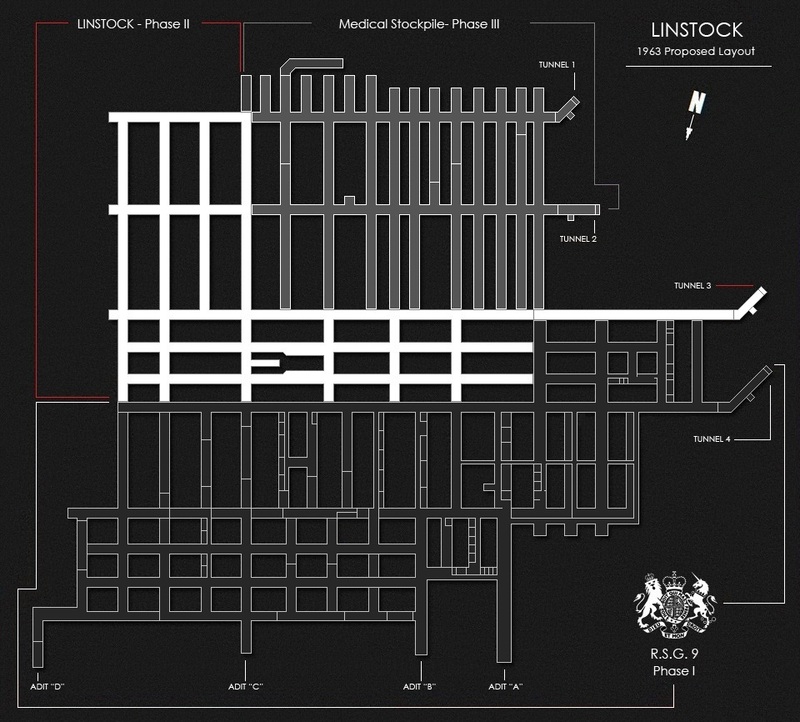 When complete "Linstock" was to be manned in the pre-attack period with 100 staff, after a Nuclear Attack it would work in conjunction with R.S.G. 9 and share command functions and facilities. Communications for hard lines were supplied by the Post Office (GPO) and would initially consist of a Private Branch Exchange (PBX), and be operated by 3 GPO staff. This would be added to with the addition of: Intercommunication with the RSG, telephone and telegraph lines to Whitehall / MOD, 1 overseas circuit and inland circuits (Tails), and 2 world wide circuits. 15 Creed 7B Teleprinters, 15 Type 2 Auto Transmitters and 7 Type 45 Perforators would also be installed for messaging. 18KW of electricity would also be needed to power the communications. The GPO estimated that the rental of the equipment would be £60,000 a year. 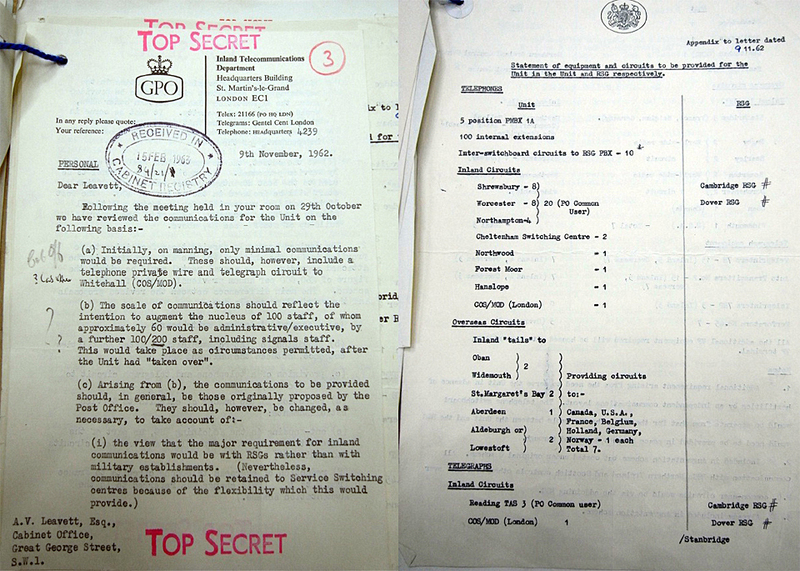 Declassified Top Secret Report from the GPO, regarding the Communications Equipment needed for Linstock - 9th November 1962. 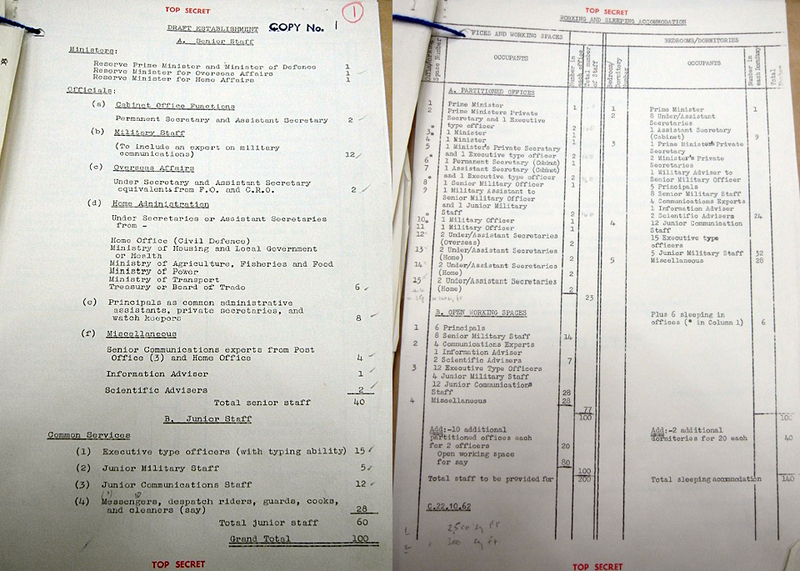 Declassified Top Secret Report, detailing Senior Staff & Personnel needed to operate Linstock & Working and Sleeping Accommodation - 1962. Declassified Top Secret Home Office Blueprint, showing the proposed area for Linstock 1962. Despite all the attention to detail, surveys and allocation of space, "Linstock" was only a feasability report. The whole project was dropped on the grounds of cost. Front Cover of Danger! Official Secret RSG-6. - 10th April 1963. Photo courtesy of Mr. Mike Kenner - Open Government Campaigner / Cold War Researcher. Up until 1963, the construction and upgrades to the RSG's had been done in secrecy, but all this was about to change... On the 16th February 1963, four Anti-War activists known as "The Spies for Peace", broke into R.S.G. 6 - Warren Row near Reading. The group photographed classified documents and removed several classified files. Copies were made of the files and re-produced in a 6 page booklet entitled "Danger! Official Secret: RSG - 6". The booklet went onto describe how "a small group of people who have accepted thermo-nuclear war as a probability, and are conciously and carefully planning for it... They are based in fourteen secret headquarters, each ruled by a Regional Commissionier with absolute power over millions of people". In reality, their were only 13 RSG's at this time. Region 1 (Northern) - R.S.G. 1 - Catterick - Gaza Barracks - North Yorkshire - Phone No. Catterick 2011, 2081. Region 2 (North Eastern)- R.S.G. 2 - The Keep, York Castle - Imphal Barracks - Phone No. York 59831, 59841. Region 3 (North Midlands) - R.S.G. 3 - Nottingham, Chalfont Drive - Regional War Room - Phone No. Nottingham 291151. Region 4 (Eastern) - R.S.G. 4 - Cambridge, Brookland Avenue - Regional War Room - Phone No. Cambridge 59800. Region 5 (South East) - R.S.G. 5 - Dover Castle - WWII Tunnels "Dumpy" - Phone No. Dover 2380. Region 6 (Southern) - R.S.G. 6 - Warren Row - Henley on Thames - WWII Shadow Factory - Phone No. Reading 61181, 62641. Region 7 (South West) - R.S.G. 7 - Bolt Head ROTOR Bunker - Devon - Phone No. Dartmouth, Kingsbridge 2611. Region 8 (Wales) - R.S.G. 8 - Brecon Depot Barracks - Bridgend - Phone No. Brecon 861. Region 9 (Midlands) - R.S.G. 9 - Drakelow - Kidderminster - WWII Shadow Factory - Phone No. Kidderminster 3474. Region 10 (North West) - R.S.G. 10 - Preston - Fulwood Barracks - Lancashire. Region 11 - (Northern Ireland) - R.S.G. 11 - Armagh - Gough Barracks - Phone No. Armagh 2230. Army Tactical Command Headquarters - Aldershot - Phone No. Aldershot 24431. London - Rotundas Cabinet War Room - Codename: Anson / Chaplin - Phone No. Abbey 1255. Spies for Peace & CND Protesters - April 1963 - Invasion of R.S.G. 6 Warren Row - Reading. Photo courtesy of Mr. Les Pearce. Camp Commandant - Major G.D. Scales. Principal Officer - Mr. S.L. Lees - Permanent Under-Secretary of the Treasury. Secretariat Staff - Mr. A.G. Hurrell - Principal Officer at the Ministry of Education. Secretariat Staff - Mr. I.H. Lightman - Principal in the Secretariat of the Ministry of Works. Senior Scientific Officer - Mr. L.H. Mann - Ministry of Aviation. Royal Navy - Admiralty Regional Officer - Rear-Admiral Francis Edward Clemitson. Army - Major-General John Francis Metcalfe - General Officer Commanding Aldershot District. Royal Air Force - Air Commodore James Baird Coward. Police -Chief Constable Mr. Douglas Osmond - Hampshire Constabulary. Fire Brigade - Senior Fire Officer Mr. E.R. Ashill - Chief Fire Officer of Hampshire. Nicolas Walter - Spies for Peace member who gained access to R.S.G. 6 - Warren Row on the 16th February 1963. Photo courtesy of PM Press. Spies for Peace asserted that the exercise demonstrated the incapacity of the public services to cope with the consequences of Nuclear attack and that the RSG Network would not work. The exercise, they said, proved once and for all the truth of the 1957 Defence White Paper that there is no defence against Nuclear War. In a hint at the source of their information, the Spies for Peace said that FALLEX-62 convinced at least one occupant of one RSG at least that the deterrent is quite futile. 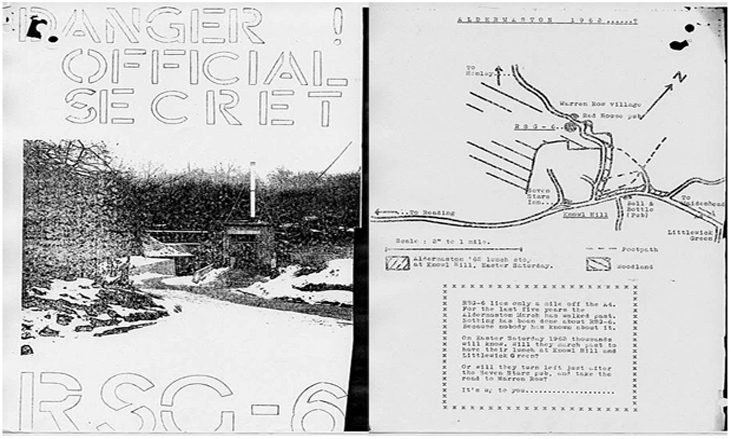 The booklet claimed that at the time of the Cuba Missile Crisis, a month after the NATO exercise, RSG - 6 was not activated. The booklet objected strongly to the fact that the RSG Network had not been publicly debated, that its staff were unelected and that they would have Military powers. 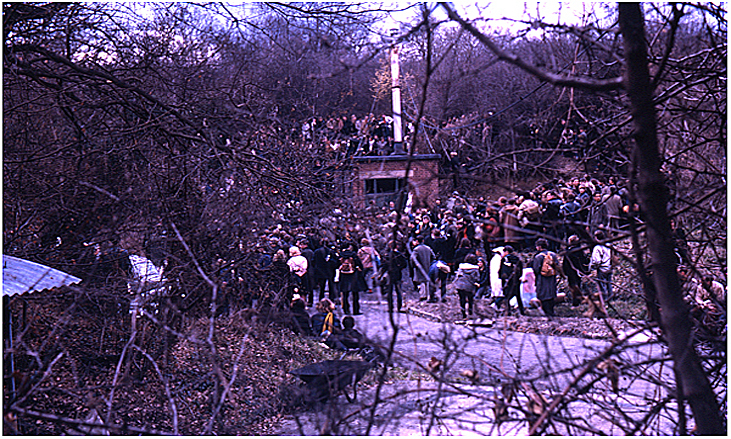 The 1963 Aldermaston issue of the CND bulletin "Sanity" included the Spies for Peace revelations, and several hundred demonstrators left the Aldermaston route and headed for R.S.G. 6 where they set up a picket. The Spies for Peace made front page news but the press was later prevented by an official "D-Notice" (Defence Advisory Notice - an official request to news editors not to publish or broadcast items on specified subjects for reasons of National Security), from saying any more about the matter. The Police tried to prevent any further distribution of the information but failed to do so. RSG's in Cambridge and Edinburgh were also picketed. Not only was this a breach of the Official Secrets Act but it was a serious embarassment to the government, a nationwide manhunt was conducted to apprehend the Spies for Peace. Although several people were arrested at the time, the original Spies were never identified or caught. 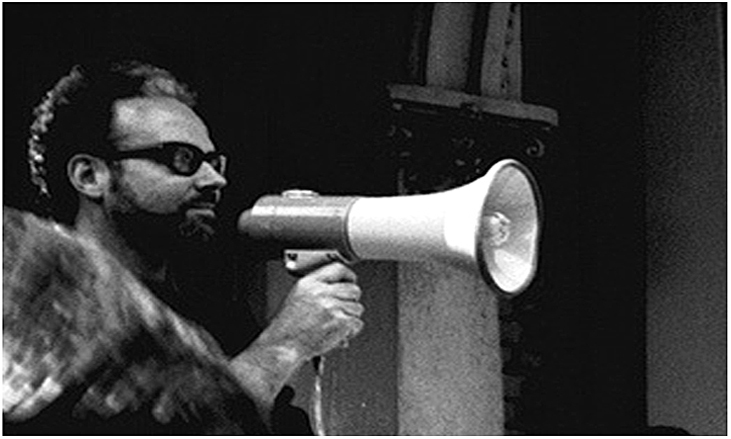 However, In March 2000, it was revealed that Nicolas Walter a former RAF linguist and later British anarchist, atheist writer, speaker and activist, was one of the original Spies for Peace. His wife Ruth, was also identified as one of the Spies. The Spies for Peace were founded in 1962 by members of the "Committee of 100", a British Nuclear anti-war group formed in 1960 by the Campaign for Nuclear Disarmaments (CND) president Bertrand Russell, Russell was a was a British philosopher, logician, mathematician, historian, social critic and political activist, he also won the Nobel Prize for literature in 1950 and received the Order of Merit from King George VI. Russells co-founder was American left-wing activist Ralph Schoenman, Schoenman was already a member of the CND and was the one who approached Russell with the idea of the "Committee of 100", Schoenman later became Russells personal secretary and became general secretary of the Bertrand Russell Peace Foundation, until Russell publicly repudiated his relationship with Schoenman in December 1969 and had him removed from the board. Reverend Michael Scott, the other co-founder was an English Anglican priest who was also a memeber of the CND, later in October 1968 when the "Committee of 100" disbanded, he joined the anti-Apartheid movement and was the first white man to be jailed in South Africa for resisting the country's racial laws. After the Spies for Peace scandal, the British Government had no choice but to make a public statement about the RSG's. The Government stated that "whilst the locations of the RSG's was not secret it would be contrary to the interests of the country if their functions and functioning were widely known". With the RSG Network now exposed, the Government had to rethink its Defence Structure, the solution came in 1964 under the title of "ACID" later changed to "PYTHON". 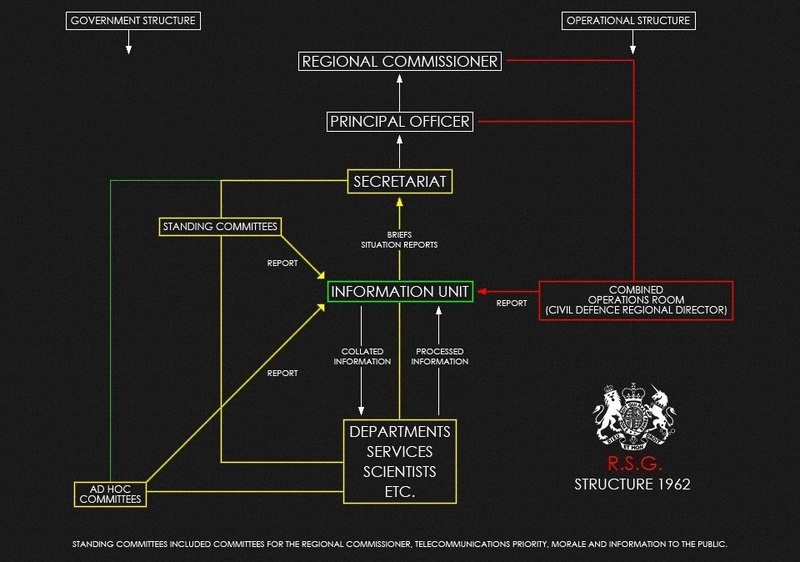 PYTHON was a simplified and much smaller version of the RSG Network, 8 PYTHON Groups (In reality this was only 5), would replace the entire network and run the country from secret locations scattered across the UK. Two locations earmarked to operate PYTHON included two ships, the RFA Engadine and Royal Yacht Brittania. Although PYTHON was intended to completely replace the RSG's, the plan was not put into effect until the 1st May 1968, some 4 years after the plan was originally conceived. The PYTHON programme, and even its locations still remain TOP SECRET to this day. 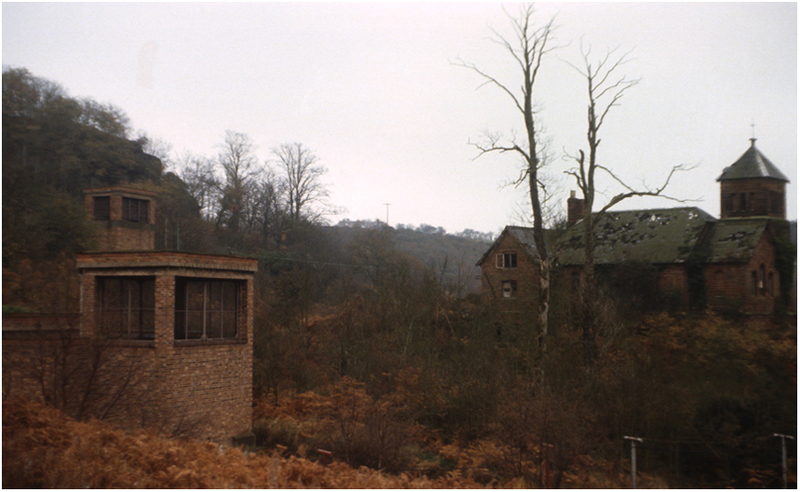 RSG 9 Vent Shafts to Tunnel 4 & Tunnel 3, Blakeshall Common School (Right) - Demolished 1979 - 1984. Photo courtesy of Subterranea Britannica - Taken 1979 / 1980. In December 1964 the Prime Minister made the decision "to delay any further considertaion" for the purpose built RSG's, due to the huge costs involved. This decision was followed by a damning report from the Ministry of Defence, stating that the Regional Commissioners and the nationwide evacuation of the population could not be carried out in time, if Nuclear War was declared. The same year the RSG's were redesignated as Sub Regional Headquartes (S.R.H.Q.). 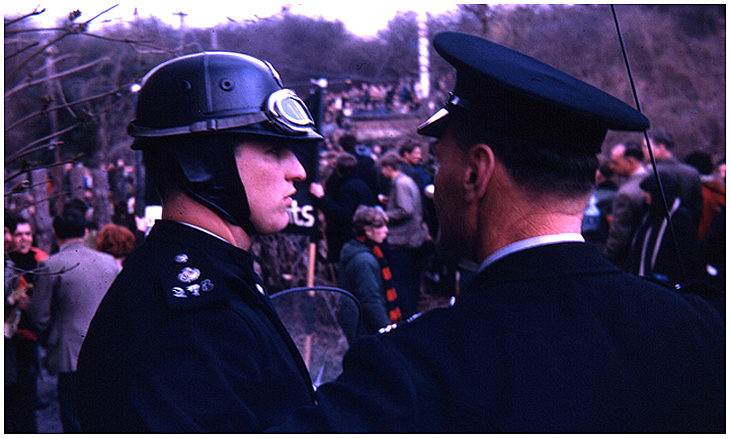 Excercise CIVICLOG 65 was to be the last excercise the RSG's were to take part in during May 1965, but due to changes in the Governments policy and re-structuring of the RSG's the excercise never happened. In 1966 the Government reorganized the RSG structure once again, this time to: Sub Regional Controls (S.R.C.). This title stayed until 1971 when once again the name reverted to S.R.H.Q. this remained in place until 1979. RSG 9 - Drakelow was officiallly deactivated in 1979 and placed under Care & Maintenance. 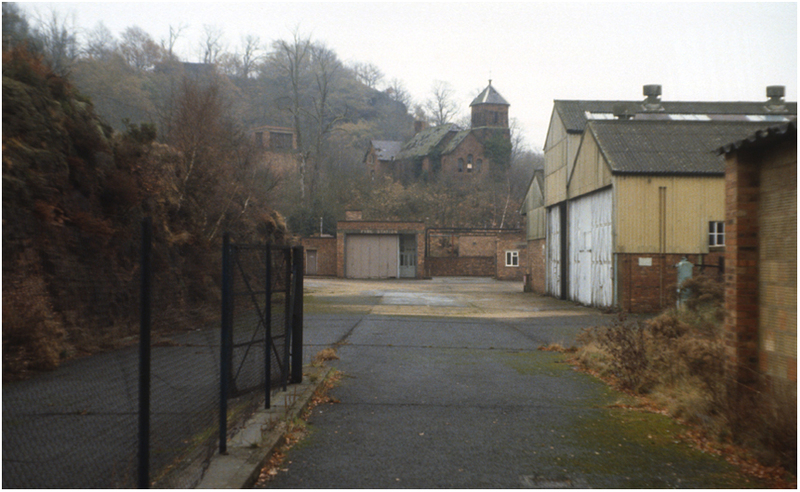 RSG 9 Surface buildings - Blakeshall Common School, Fire Station & Coal House (Center), Transport Shed (Right). Demolished 1984 - 1995. The history on RSG 9 Drakelow, and the RSG Network most of which still remains classified, is the result of over 20 years of research. Credit for this work and donated material is dedicated to the following people: Please click the White hyperlinks to be directed to their websites. Mr. Paul Stokes, author of "Drakelow Unearthed" which chronicals the history of Drakelow Tunnels - RSG 9 History & Communications. Steve Fox, author of "Struggle for Survival, Governing Britain after the Bomb" - RSG Network History & Structure. Subterranea Britannica - RSG 9 Photographs, Defence Regions & RSG History. The Drakelow Tunnels Preservation Trust - RSG 9 History, Linstock Files and Graphics. Mr. Les Pearce & PM Press - Spies for Peace Photographs. Mr. Richard Cruise - RSG 9 Photograph.